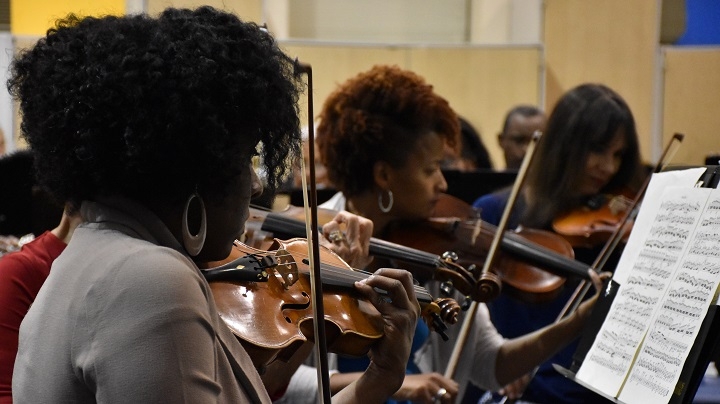 The Petersburg Symphony Orchestra marks a milestone this year, its 40th season. Founded in the late 1970s, the orchestra involves performers of all ages and backgrounds, works with local schools and continues a mission to “entertain, educate and enlighten.” WCVE’s Catherine Komp has more for Virginia Currents. Learn More: The 40th PSO season begins Sunday October 22, 2017 at 4:00PM at Tabernacle Baptist Church Community Life Centert, Petersburg, VA. Find more details and concert dates on the Petersburg Symphony Orchestra website and on Facebook. At Virginia State University’s Davis Hall, musicians pull out their instruments and warm up. It’s a diverse group, teenagers to seniors, different racial and economic backgrounds, some professionals others amateurs. At the front of the room is Ulysses Kirksey, conductor of the Petersburg Symphony Orchestra. He joined the orchestra in 1980. Ulysses Kirksey: The beautiful thing about it is that we have a mix of the professionals with the amateurs, because the professionals are sort of the role models and they are placed in positions of leadership and they pull the amateurs along. So I think it's a beautiful thing when you have both professionals and amateurs working together. More than four decades ago, the late Dr. F. Nathaniel Gatlin retired as VSU’s Director of Bands. He had a new dream - a dream some thought was impossible. Kirksey: He wanted the Petersburg Symphony to be a separate entity, a bonafide symphony orchestra representing its city. I mean you go around the world you know, name any city: New York, Chicago, Los Angeles, Houston, Dallas they all have world class symphony orchestras -- Berlin, Vienna, Amsterdam-- Petersburg! And that's what he wanted it to be an orchestra that represents the city that bears its name. David Chambliss: Dr. Gatlin. I recall that he would walk the streets asking people to donate. David Chambliss is a percussionist, manager and charter member the Petersburg Symphony Orchestra. He says Dr. Gatlin went to the local Chamber of Commerce and Phillip Morris to raise funds. Chambliss: He was like a machine. He's just never stopped. When I look back on it, I don't know where he found the time to devote all this energy towards building this symphony orchestra. Nelson Lawson: Everyone always had something great to say about Dr. Gatlin. Nelson Lawson has been PSO since it’s inception too. He’s a french horn player and assistant conductor. Lawson: He was always there, he made himself available to people for questions, for where they wanted to go in life. He was a good counselor. Everybody called him Pops because he was like a great dad. So, Pops was just wonderful to me and. I can't say enough great things about him. Lawson says Dr. Gatlin was a bit like the celebrated Green Bay Packers Coach Vince Lombardi. He used to quote him too. Lawson: He said if you’re winning the game by passing don’t run. What he meant by that, if you are gaining some type of success in your musical career, if it’s performing for audiences or for churches or wherever, just keep doing that. Because it’s not just building you as a musical person f but it also sharing something with all those churches, schools, what have you so that’s one of the things that comes to mind. Dr. Gatlin recruited retirees from the Richmond Symphony Orchestra and students like Robin Tillar, charter member and principal flautist. Robin Tillar: My husband and I both joined. At that time I had a two-year-old son. He would come and sit right next to me, because we didn’t have babysitters, and so he grew up in the symphony too. And in the early years it was more like a band. It was a lot of flutes and wasn’t a lot of strings. So it was like a band. He kept pulling in strings from Richmond because there wasn’t a lot in Petersburg. He was a go getter. Retired Colonel and VSU Vice President Porcher L. Taylor Jr. has been involved with PSO since it’s earliest days. He says during that time, segregation was still rampant. But the orchestra and the long-running Walk Against Hunger brought down barriers. Porcher L. Taylor Jr.: In every performance, and I haven’t missed very many of them in all those years, I always count the audience; see how many blacks, see how many whites we've got here and so forth. We're all sitting all mixed up. It's just one-- it's hard to explain. If you've been living in a segregated world most of your life, this is a big eye opener for you just to see this happening, to see people getting along. In 1989, Dr. Gatlin was doing what he loved, conducting, when he died. Kirksey: He did go, we say with his boots on. I've never seen a man more happy that he was when he conducted his orchestra. And I think that that's what kept him going. That's the way he wanted to go at it. It didn't matter if it was a rehearsal or a concert. He grinned from ear to ear in rehearsals and just really enjoyed what he was doing. Uyless Kirksey became the next and second conductor of PSO. Both leaders, says teacher and trumpet player Nathaniel Boyd, have pushed musicians to new levels. Nathaniel Boyd: We have a great conductor and a matter of fact, both of our conductors are awesome. He brings it out of us so it comes across, yes it does. He challenges the whole orchestra and he pulls it out of us. I bring my skills when I come here. He takes his skills and he molds it.He's like a potter, he molds the sold and the finished product-- that’s Mr. Kirksey. Petersburg often makes the news because of challenges the city has faced including poverty, crime and financial mismanagement. But Kirksey, Chambliss and others say the orchestra provides a sense of hope and pride. Kirksey: This is what I consider to be an underserved area, culturally particularly. The school systems have been suffering as many people know, the city of Petersburg has suffered financially over the last few years. We've gotten quite a bit of support from the city of Petersburg over the years but this is a rough time and they have to get past this patch. But I think that many of our city leaders are aware of how important an orchestra is in this community, what a cultural gem that we have here. And they've given all their support to try to keep it alive and keep it going. So we're very thankful for that. Chambliss: The community sometimes is measured by the cultural activities that exist in it. And if things are happening artistically in a given community, then it has a tendency to uplift the community, it has a tendency to to attract people to your area. And it's a means of getting people involved. So if we continue to support and attend the concerts and get people involved in cultural activities in the area, we all win. We’re all winners. Kirksey: We've had some rough times but then we look back and we're just so thankful to have reached this great milestone. Chambliss: When the seeds are planted and we continue to make this happen year after year after year, just like planting seeds. Dr. Gatlin planted a seed in this area and he sat back and watched it grow. And it's still growing, all the time. For Virginia Currents, I’m Catherine Komp, WCVE News.